you tried doing test 21? did you update the OBC from one type (11 button I think y'all call em) the 18 button? Last edited by attack eagle; 01-21-2009 at 09:58 PM. You know, I actually think I have not done that. I think I will give that a try in a few. Unfortunately, there is only one BMW around me. And it is an expensive one. Ok, off to try like 256 combinations or something like that. The E36 is totally different. The OBC + display is integrated into a single module, with only sensors and an interface to the Check Control module wired into it. There's no "bus" that can be intercepted for the display data; that is internal to the unit itself. Thankfully, the display and computer boards inside the E36 OBC are separate. This will make interfacing much easier than trying to tie a microcontroller into an array of LCD pixels. Not that it can't be done, but it's just easier from an interface standpoint if that's already done for you. The 20-odd functions of the stock OBC are fine, but as an engineer I couldn't resist hacking a dot matrix display and a bunch of buttons to do more than the usual functions. Personally, I'd like to have other sensors such as engine oil temp/pressure, engine coolant temp, etc integrated into my car without installing aftermarket gauge pods. Having an "open" platform of hardware and software will open the door to other possibilities as well. I'm just trying to see where this leads. I love threads like this. Hopefully it will lead to something other than a bunch of anticipation and tired fingers. Ok, I have it all apart, I will get some shots of the IC's in the morning. This is an interesting idea. I can put hours in this project but first want to discent slightly from this notion of ripping the whole inside and putting a new pc. If someone has the 18 button OBC open, can they provide details such as the microprocessor, memory and display controller ? We should asses the possibility of just reprogramming the thing, or at least make a basic ROM routine that will just send out keypress commands OBCII and sensor data out to the carPC, and display messages comming from it. Comments? Anyone has a project unit already? The ability to display oil temperature on the OBC would be a deal maker for me. It's the only real guage I'm missing that I need. Sounds like an awesome idea if you ask me. If this goes anywhere I'll be all over it. If someone has the 18 button OBC open, can they provide details such as the [COLOR=blue! important][COLOR=blue! important]microprocessor[/color][/color], memory and display controller ? I too originally wanted to go the "reprogram" route, but then after seeing how there's no data available on the now obsolete processor, I'm going to just make my own. The PIC18xxxx series of microcontrollers have plenty of I/O to make this project a reality, plus they have USB support in hardware which will make a CarPC interface a breeze. Even if there was data to be found, there's no external memory aside from a 1024-bit serial flash IC (Microchip P/N 59C11) that's presumably used to store things like the "Einheit" numbers and such. The CPU is most likely a vendor-specific (Siemens) run that's OTP (one-time-programmable). I highly doubt it's got any flash memory inside. I'm currently in the process of reverse engineering the display controller board pinout. Once that is done, we should be able to start to decode the display controller interface. It appears at this point to be a standard 4-bit LCD interface, with 2 driver chips, one for the "main" OBC display and one for the "clock" display. 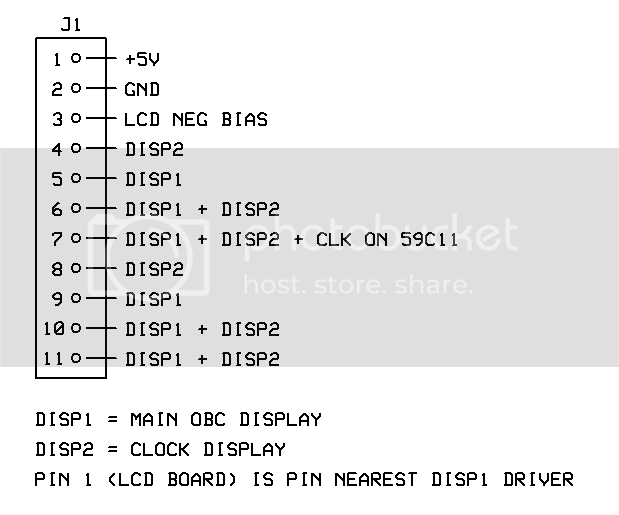 The separate lines to each driver (pins 4, 5, 8, 9) are probably SELECT and CLOCK for each display driver chip. The shared driver lines (pins 6, 7, 10, 11) are probably the 4-bit data bus. So you want to draw a new board for the microcontroller? And weld it to the screen driver? I think this is the right path. But it will also need to have the exact holes for the connectors. I have the E36 schematics so I will do the pinout for each connector. Regarding the display driver, I have a pdf datasheet for thgat kind of driver somewhere at home. Will email it tonight if you want it. Yes I plan to make a new logic board to replace the one in the stock OBC. It will be the exact same shape and size, with the X1070/1071 connectors on it as well. If those connectors are too difficult to source, then a simple 2x9 header for each should work, only it will lack the "locking" feature the factory connectors have. I have access to a logic analyzer @ work, so I might have to hook that up to see what the communications is like from logic -> display board. 6 F27 fuse, X17 26, some kind of lighting. Pull down resistor input. 12 pull up resistor, temperature sensor. 16 Light switch. Feeds backlight? 1 CODE, inmobilizer control unit. 4 low beam switch, pull up resistor input. 6 TI? EGS control unit, pull up resistor input. What about the unknown pins, are those N/C? The schematic is not showing anything for those. I do not know how the fuel signal goes into the OBC. According to the schematic, a 12 pin (X271) pin 1 comes from fuel tank level into the instrument cluster, and it may go to the OBC as X1071 pin 10 or maybe X1070 pin15. We will need to test this out. Are the TXD and RDX (pins 5 and 7 on X1071) the same lines that appear in the OBD-II port, for vehicle diagnostics? Last edited by m2pc; 01-22-2009 at 06:06 PM. Ok, here are a some shots of the chips on the 11 Button OBC. Including the display drivers. They are not the same as the ones on the 18 Button. I wonder if it's pin-compatible to the ones I have in my 18-button... I'll do some more checking with the continuity checker later tonight. If that is the case, that would be good. Would not need to worry about the outdated IC on the 18-Button, or just on some of the OBC's. Wonder if this is newer or older then the one you have? Date on this one seems to be 05/93/25, Guessing that is the date. Last edited by fPortal; 01-22-2009 at 06:34 PM. Is probably time to list the interfaces that the new board will accommodate. Last edited by Mefis; 01-23-2009 at 09:30 AM. I like the GSM idea. I would not mind having EGT as well. Just helpful for tuning. Maybe even an A/F reading. UPDATE: I checked the display driver ICs on the 18-button OBC I have; they're a totally different pin count, so no match for the ones in the 11-button OBC. Next, I'll be building a power harness to run my test OBC from the bench and use a logic analyzer from work to decode the digital I/O signals. - Automatic 1/4 mile timer? - Tunable display color using RGB LED backlight vs. stock incandescent bulb. Allows you to match the OBC display to your other interior lights. Can also allow us to have the display automatically change colors/flash for "critical" warnings. This in Amber, Blue, and Red would be fabulous. I think you should check out gumstix...its got everything you need, including a color screen. I used it on my other projects..
Well, we are talking about a lot of analog I/O and high current outputs for relays. modules like the GSM and GPS are TINY and CHEAP only if you buy the module that can be welded into a motherboard. I don't know if gumstix can accomodate these, but will look into it. Regarding features i wanted not to include a list of software features at this point, just the hardware needed to fit in the board. For instance 0-60, 1/4 mile, altimeter, slope, can be programmed with the GPS. Ext temp Fuel level Fuel pressure Oil temp Oil pressure, General P.
m2pc, can you provide measurements of the OBC main board?